On April 4, 2015, Dave Russo and his 10-year old son Sam experienced a one-day 38-mile bike tour on the Long Island Motor Parkway. In the tenth post of this series, Sammy and Dave continued their exploration after leaving Bethpage State Park, crossed Round Swamp Road and on to the Battle Row Campground in Old Bethpage. Once you exit Bethpage State Park, a residential area is built over the Motor Parkway. Interesting to note some of the street names here include: Vanderbilt Lane, Motor Lane and Toll Road. On Round Swamp Road, the Plainview Fire House location is built right next to the Parkway. The bridge abutment is right across the street. The remnants of the abutment of the Round Swamp Road Bridge. 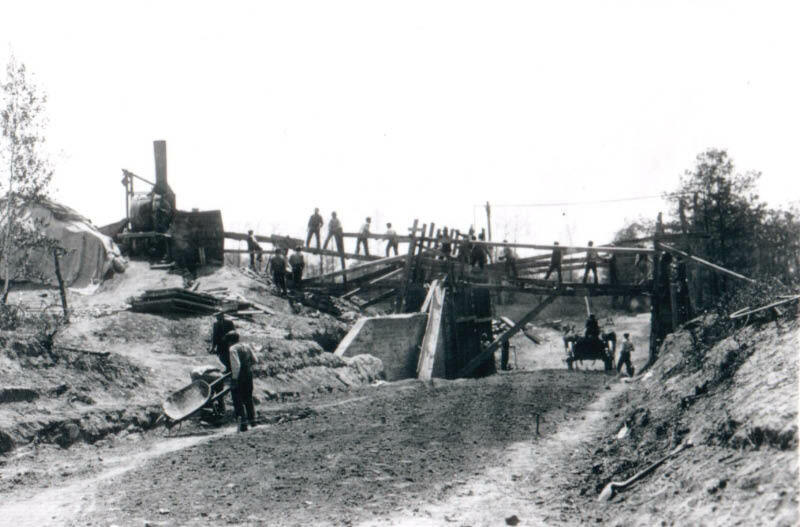 The same abutment can be seen on the left when the bridge was being built in April 1910. Another wall built after road was closed to restrict riders - as you can see the sun is starting to set and we are running out of time. Continuing east - nice spot leading into Battle Row Campground - where there are always interesting people to see! Battle Row is fairly interesting - lots of posts lying in the weeds. The Motor Parkway pretty quickly makes a left hand turn over Spagnoli Road - former bridge location, nothing remains and into the Old Bethpage Village Restoration. Believe it or not, our second annual “Vanderbilt day” is upon us. We will be making the journey again tomorrow. If there are any locations that anyone feels needs further pics or investigation let me know today! Don’t worry frank, the Caroline posts are on the list for more research. Sam and Dave, this is exciting. I’m guessing you guys will be traveling east from the Maxess Rd bridge. If so, an area of interest is north of Colonial Springs Rd, where the LIMP bridge once crossed over (never visited there). Lots of open space here, and away from residential development. This area appearing swampy, could be tough to navigate. Hopefully will be fun. Best wishes on this adventure and looking forward to the updates. Have fun! Frank—nope, we did the Queens to Melville tour again. Great day. I’ve been to the locations you mention. They are ok and worth seeing but it’s hardly a “journey” like our trip along the more historic route. You guys rock!! Sounds like another ~38 miler. You picked a great day for it too. I understand there’s lots to investigate with limited time. This is a total 45mi. puzzle with lots of missing (or hiding) pieces, and with many twists involved. I wouldn’t have it any other way! Lol. Can’t wait to see the pics of this journey. I do have some updates / news. I will send all to Howard. Another great day with the little man!